The FNW figure X431 press check valve for water service is suggested for all applications where labor and time savings is a must. The figure X431 allows quick installation on copper pipelines meeting ASTM B88 standards. 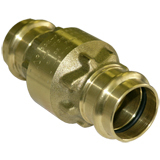 The structure of the valve, made in dezincification resistant brass, guarantees excellent corrosion resistance particularly in the connection areas of the pipeline.